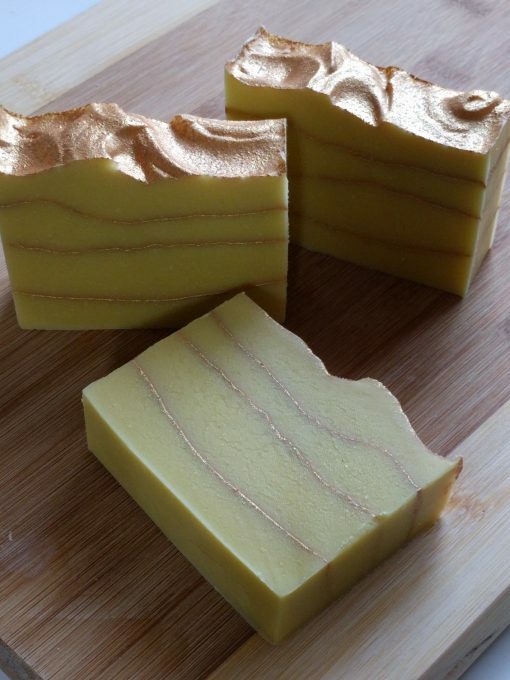 This soap is scented with a sweet Meyer Lemon fragrance, giving it a wonderful gentle citrus scent that matches the warm yellows and gold mica of this soap bar. We use Cocoa Butter and Sweet Almond Oil to add lovely conditioning elements to our soaps, leaving a soft but clean feel. All our soaps are made by hand using the best of ingredients. We use organic and sustainably sourced oils from reputable suppliers. All our soaps are crafted using the cold process soap making method and using our custom formulas for making luxury soaps. Note that each bar is hand cut so weight may vary and there may be some cut marks or small dings on the bar. This listing is for one bar.